At the time I enrolled in the Sofaer International MBA program at Tel Aviv University, I had completed an undergraduate business degree in the US, worked as a management consultant for a major US firm, and was near completion of my military service as a combat medic. 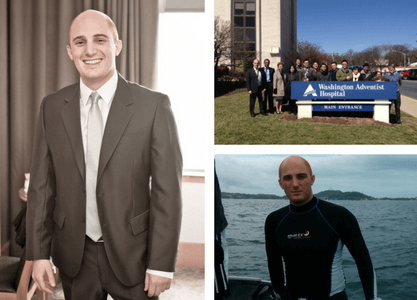 I had always enjoyed business and decided that earning an International MBA would valuable for transitioning back to the private sector. I also wanted to leverage my medical and military training to focus on biomedical and healthcare-related business, with an emphasis on commercialization of innovation and startups. I thoroughly researched several international programs and was confident in my decision to choose Tel Aviv University. By then, the Israeli start-up scene had already developed a global reputation as an innovation leader. Within a few months of me starting the program that perception was further articulated and became a brand with the release of the book, Start-up Nation, which formally explored, documented, and named the phenomenon of the Israeli start-up culture. In the years since, international business delegations, investment, and deals coming to Israel have exploded, particularly from Asia. It has been an amazing trend to witness and be a part of. Beyond traditional business coursework (taught by leading professors from both Israel and abroad), the MBA program provided a unique opportunity to be exposed to innovation and start-up-focused learning opportunities. These included courses such as Hi-Tech M&A and Innovation in Healthcare, hosting of international business delegations, visits to local start-ups and innovative multinational firms, and participating in an international business case competition (our team won first place in the country!). I also had the opportunity to work on investment diligence projects for a leading Israeli healthcare venture capital firm evaluating medical investments. The program even provided the opportunity to join a business delegation and pursue a student exchange study abroad program, which I took advantage of. After witnessing firsthand Asia’s growing hunger for Israeli innovation, I chose Nanyang Technological University in Singapore (“The Gateway to Asia”) for my student exchange. I took regionally relevant courses such as Sun Zi Art of War Applications to Business, Asia Pacific Business Law, and Mandarin Chinese. Joining Nanyang’s water polo and biathlon teams, as well as traveling throughout Asia during that period were unique and valuable personal and professional experiences as well, no less useful to my career than the formal studies. 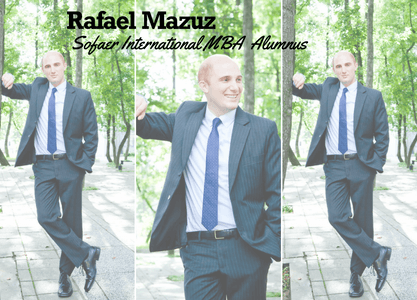 One of the most cherished aspects of the Sofaer International MBA program was the opportunity to simultaneously explore both the start-up side of a business and how those innovations interface with the multinational corporations and international markets where commercialization happens. This is a crucial “missing link” that many startups and larger corporations alike do not have an understanding of. The results are that frequently, 1) the startups create solutions that lack understanding of their market and end-users, and 2) the larger corporations (and even entire cities and countries) squander tremendous resources attempting to promote “innovation,” without actually understanding how that comes about. Upon completion of the program, I wanted to gain a deeper understanding of healthcare systems to understand better which innovations would add the most value. So I accepted a US-based director position with the world’s leading provider of wound care management services. There, I spent over five years leading and managing multi-million dollar hospital and clinic-based departments specializing in the treatment of advanced wounds. This period was priceless for two reasons: First, it gave me an expertise in the clinical and business aspects of wound care, regenerative medicine, and related medical specialties (vascular, orthopedic, and plastic surgery, infectious disease, etc.). Second, it exposed me to broader trends, challenges, and opportunities in the healthcare sector, regarding both the management and delivery of care and the market for medical devices and other products. Eventually, wound care and related start-ups began to approach me for insights and assistance on solutions they were developing. At first, they were primarily Israeli startups that heard about me through word-of-mouth, but that quickly expanded to other countries (especially the U.S.). At the same time, top executives of medical device companies (whose products are used in the wound care units I managed) would perform ride along with their sales teams and product managers, visiting the centers I managed. They would find value in the meetings because we would provide invaluable feedback on their current and planned products and strategy. Several successful advanced wound care products on the market today heavily incorporated our feedback in their designs and business models. Some of those same executives (and others I would meet at industry conferences and trade shows) would also connect me with their colleagues managing overseas divisions, given my experiences in those markets. On multiple occasions, I would connect them with overseas partners or facilitate deals, especially in Israel and Asia. A Tel-Aviv University MBA colleague from China and I have collaborated on some of these engagements, too. As my dealings with both startups and multinational corporations intensified, I eventually left my wound care director position to pursue those opportunities full-time. I am currently based in Washington, DC, but I spend significant time overseas (including Israel and Asia), engaged in both business and advisory, which are equally divided among multinational corporations and startups. In fact, I am writing this entry from Southeast Asia right now, where I am performing due diligence for a multinational medical device company’s planned product launches here. I am also a part-time co-founder of a US-based chronic care management startup, and actively advise several other startups, including ones working on innovative surgical dressings, wound care diagnostics, and medical laser solutions. I credit the Sofaer International MBA at Tel Aviv University for providing opportunities and opening doors for me. However, many of my friends in traditional MBAs indeed received more “hand-holding.” So those looking to simply attend class and have a coordinator set them up for internships and job interviews with minimal initiative may want to look to other MBA programs. However, for those who are eager to roll up their sleeves and seize an opportunity to fuse innovation and commercialization (whether to work with startups, larger firms or to bridge both), the Sofaer International MBA from Tel Aviv University is worth serious consideration.